In an ongoing conflict, where victories for Israeli settlers and the Israeli occupation seem never-ending, one farmer prevails and succeeds in getting his land back. Bashar al Qaryouti dedicates his life to struggle for human rights and document violations of these rights in the West Bank. Photo EAPPI/H. Kjollesdal. Sometimes we see a case where Israeli settlers in the West Bank do not succeed in their plans of expanding their territory. Instead, Palestinians are able to show that law and regulations can prevail. However, relevant knowledge and ability to mobilize are needed in order to create a victory. On the evening of August 11, Israeli settlers from the settlement of Shiloh, southeast of Nablus, walked down the hill to a field that is owned by the Palestinian farmer Muhammed Abed Aziz. They brought with them materials for setting up a fence and tried to install pipes for a new water system. The settlers started to cut down the almond trees on the field. They wanted to cultivate their own produce. Bashar Alqaryouti lives in a nearby village. He has a long history of bringing his video camera for documenting Israeli settlers that are violating humanitarian and other laws. Bashar often facilitates protests against these injustices. On this day, he arrived on the scene early enough to document what happened and save it on his large memory stick. Bashar alerted the relevant Palestinian authorities who called the local Israeli District Coordination Office (DCO). Israeli soldiers were dispatched to the grounds of Muhammed Abed Aziz. The police also arrived. Bashar also contacted the Israeli human rights organization, Yesh Din, to monitor what was happening. The soldiers had no choice but to evict the settlers from the field. The police investigated and confiscated the tools of the settlers. The fence was removed. This was a total victory for the farmer Aziz. He was able to get his field, close to Shiloh, back. This case demonstrates that justice can prevail when Palestinians use the system wisely. Success depends on many factors. Aziz was able to provide papers to show that his property was fully registered under his name. He proved that he was undoubtedly the owner of the land. 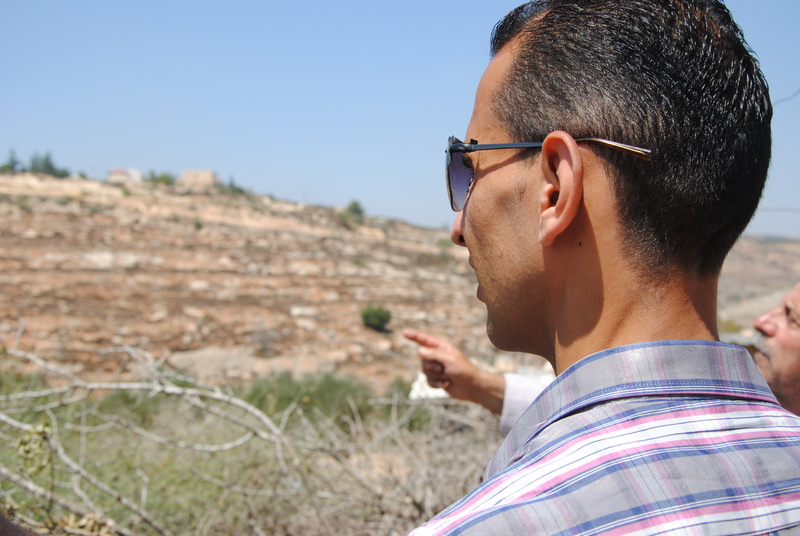 Land registration is often difficult to document for Palestinian farmers, whose claim to the land often stems from the fact that their family has cultivated this land for generations. They often have old land registration deeds from Ottoman times or documents from the British mandate or Jordanian protocols. These kind of papers, however, differ from those required by Israeli regulations created after Israel took control of the West Bank in 1967 and they may be contested. Aziz had a keen mind to know what land registration documents are valid today. Many farmers do not have the necessary papers after having fled as refugees during the 1948 and 1967 wars and then returning to an empty house. Moreover, the land ownership might be in doubt if it lies in Area C, 60% of the West Bank which is under full Israeli military & civil control as delineated in the Oslo Accords. But Aziz was able to document without a doubt that he owned his field with almond trees. The settlers had miscalculated the situation and were forced to face an eviction. Bashar was there to catch the settlers’ trespassing with his revealing electronic eye. Some days later, we meet Bashar on the terrace of his fathers house in Qaryut. He spends a considerable amount of time confronting Israeli settlers and the Israeli authorities who let injustice prevail. His biggest project is to remove an army blockade on a road that forces the people in nearby villages to drive an extra 30 kilometres everytime they need to go to Ramallah, which is not only time-consuming, but also expensive. The blockade has other ramifications as well. Bashar has been involved in many of the 120 demonstrations against this blockade throughout the 13 years it has been enforced. The case of the blockade is still hanging in ”the system,” the Israeli authorities reply when Bashar asks them about the final outcome. The purpose of the blockade, according to Bashar, is to tie settlements together by aquiring land on both sides of the road. As the farmers cannot reach their land because they can not use the road, they have difficulties cultivating it. The land will become state land after 10 years without ploughing and can then be bought by new owners. ”Why can’t you take this guy with you to Oslo and keep him there so I can have some sleep at night?” Bashar’s fathers utters looking at me with a smile. He is worried about his activist son, but evidently also proud of him for spending so much time defending other peoples’ rights in a conflict that causes so much pain.